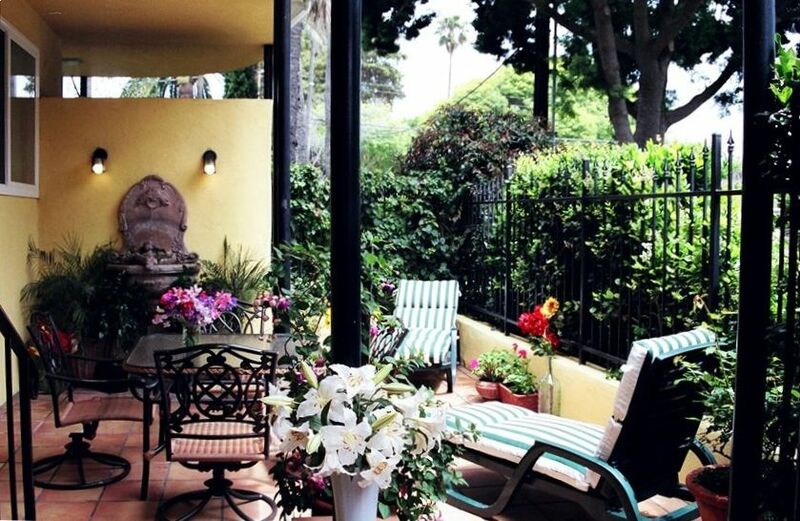 Welcome to our Santa Barbara Beach Getaway which is the best value for a 2BR/2BA in Santa Barbara. It is unmatched for its location, quality and price! The Beach Getaway resides in a historical turn of the century building and retains the charm of the day’s bygone. It has been lovingly restored to reflect Santa Barbara's style including hand cast plaster, 10 feet vaulted ceilings and Waterford fireplace giving it both a romantic and European feeling. The large and private courtyard is encased with green shrubbery and offers Italian fountain, dining table and chairs, chaise lounges and stainless steel BBQ to enjoy the local favorites. The sparkling open and fully equipped kitchen was designed with high quality construction, including granite countertops, hardwood floors and custom cabinets that are complimented with all appliances: Refrigerator, stove, oven, dishwasher, microwave and washer and dryer. Its granite counter tops include a dining area for 5. The warm and cozy living room has hardwood floors, Waterford fireplace, pull out couch, 46' TV and a view of the private courtyard through the french glass door. The queen bedroom has a sliding glass door with garden view, that leads to a private patio and is accessible by this bedroom only. The second bedroom has a king bed, small desk and wireless internet throughout. Each bedroom is complimented with a full bath, each with a shower/tub combination. The bathrooms offer limestone floors, granite countertops and French white tiles. When you book with us, you are booking directly with the owners, which means you are not dealing with a management company, or a 3rd party call center, or a computerized mobile application. Often times the 3rd party does not live in town or even know the property. We know our properties intimately, as we both own and manage them, and have a 15 year track record. Our seventeen independent FIVE star reviews speak for themselves, including our cleanliness. Also our history as a vacation rental ensures that the property will be delivered. Unfortunately there are some fraudulent offerings and sometimes rental agencies have the ability to 'substitute' your property with another. While priced slightly higher than most 1BR/1BA’s, the Beach Getaway offers a comfortable stay for 2 couples or a small family. Most of the single hotel rooms are priced higher and yet our Beach Getaway offers so much more. Or you can upgrade to our Santa Barbara Ocean Getaway VRBO #20308 which offers approximately 1/3 more square footage and slightly higher amenities. Or rent both, which are side by side, for 4 bedrooms and 4 baths. We welcome a comparison to the 200+ vacation rentals and Hotels as we are unmatched in location, quality & price! My husband and I own and manage our property which enables us to give attention to detail and to our guests. We work hard to retain our 50% repeat business and it shows in the warmth, cleaniness and quality of our property. This is truly the way to enjoy Santa Barbara. We are walking distance to all - the beach, harbor, public pool, Stearns Wharf and the main street downtown (State Street) that hosts the best restaurants, shops and theaters. We also offer rare private reserved parking, enabling you to park you car freely. Why waste time in traffic or looking for parking as parking in Santa Barbara can be a challenge and the highways do experience significant traffic delays. We are located in a residential area, not a commercial thorough fare or next to the rail road tracks or highway. We also offer a large private courtyard with Italian fountain, chaise lounges table and chairs and gas grill, that enable you to relax and enjoy the sun, or cook you local favorites on our gas grill. You will not find a comparable vacation rental when comparing location, quality and price! Unmatched IN SANTA BARBARA for the location, quality and price!, Wireless High Speed Internet access, Private reserved parking, Private courtyard with Italian fountains, chaise lounges & Gas grill, Waterford Fireplace, Washer/Dryer, phone CD and stereo, stove, 2 queen beds and full size pull out sofa, 2 full baths, linens provided, Lovingly restored turn of the century building, Antiques imported from Europe and dating to the late 1800's, Steps to Beach, Stearns Wharf & downtown. ALL FOR LESS THAN THE PRICE OF A SINGLE HOTEL ROOM. Location, location, location...couldn't be better. Walking distance to everything - the beach, the Funk Zone, downtown. Cozy, cute place with all the essentials. Easy check in and check out. Even has convenient parking. Definitely will come back her when we visit Santa Barbara. Perfect in town location. Walk to everything. Will be back. Great location close to beaches, ocean front, and downtown amenities. Very clean. Well appointed. Great location close to beaches, ocean front, and downtown amenities. Very clean. Well appointed. Hosts quickly responsive to all questions. I would stay here again. We love this area of SB and were rewarded with a clean, well-kept, lovely 2 bed 2 bath residence. Close to the ocean and many if our favorite places to visit and indulge. Highly recommended to stay again. Thank you.